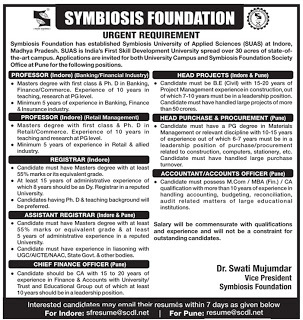 Symbiosis Foundation, Indore has advertised in the TIMES OF INDIA newspaper for the recruitment of Professor job vacancies. Interested and eligible job aspirants are requested to apply within 07 days from 17th August 2016. Check out further more details below. University Profile: Symbiosis International University (SIU) is a private coeducational, multi-institutional university located in Pune, Maharashtra, India. It has been given official recognition by the UGC and the AICTE. The National Assessment and Accreditation Council has conferred an 'A' grade to the university. SIU is part of the Symbiosis Society which is its managing body. How to Apply: Interested and eligible candidates may send their duly filled application and resume along with recent passport size photograph and necessary documents to the following Email ID within 7 days from the date of advertisement.